With modern technology, we have several ways to transfer files from one device to another using mainly Internet, or the older but still in use, Bluetooth technology. But both transmission methods have advantages and disadvantages. Through apps that require an Internet connection, you can transfer files containing a large amount of data on a relatively high speed. But in order to exchange data, of course, you need an internet connection. The problem arises when we are facing absence of an internet connection. In the absence of connection, we have to use Bluetooth technology which prevents the transfer of large files size, given the low speed of transfer and reception. So we feel the need to transfer files without Bluetooth and without internet connection. To address this issue, they have launched this product known as Shareit. 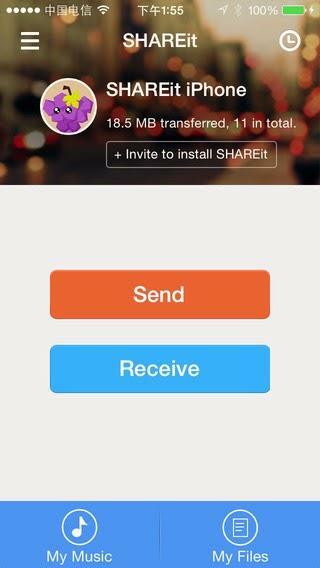 Shareit is an app created to transfer files at high speed without using any connection, if not, as we shall see, the technology tethering and Wi-Fi router. The development team says that it is 200 times faster than Bluetooth and supports all file types. The configuration of Shareit is quite simple. You just have to choose your nickname, set an icon / profile photo and you’re done. In the main screen of the app, you can see the receive and send buttons (buttons from the obvious function). The send button allows you to transfer all data from your old device to the new one. You can also view the history of the shares. Once you have set the target device which is going to receive the files, you move on to the sending process. By clicking “submit”, you get access to the files on the device listed in contacts, apps, photos, music, videos and files. Once you have selected the items you need to transfer, you have to choose the receiving device and within seconds / minutes the file (or files) is transmitted. But the question that arises is that how files are transferred? The answer is simple. The receiver automatically switches tethering and Wi-Fi router. The device, to which you have to send the files, connects with Wi-Fi automatically to the virtual network that has generated the app on the receiving device. So you see how easier it has become to transfer and share files between different devices through this incredible software names as Shareit. You must give it a try to experience the wonders yourself. You may use Shareit for PC and mobile. This entry was posted in Application, shareit for pc and tagged Shareit, Shareit app, shareit for pc. Bookmark the permalink.